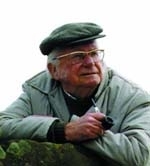 This author is Alfred Wainwright, almost always identified as A. Wainwright, the British author of walking guidebooks and sketchbooks of Great Britain. If the author of your book is not this person, please re-enter the full name in the author box instead of the surname and first initial only. Then your book will show up on the correct author page. Thank you for your help. A. Wainwright is currently considered a "single author." If one or more works are by a distinct, homonymous authors, go ahead and split the author. A. Wainwright is composed of 8 names. You can examine and separate out names.